Get a pizza Free when you purchase another of equal or lesser value every Sunday night! 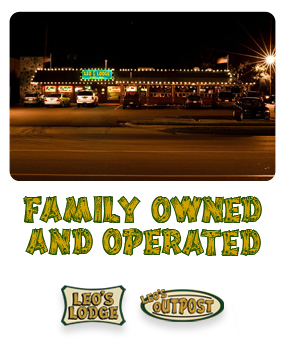 Open for business since 1996, Leo’s Lodge Restaurant and Bar on Jolly Road at Dunckel will provide you with a taste of Northern Michigan without having to drive further than the Jolly Road exit off US-127. Just two miles from MSU, the Lodge’s up north cottage atmosphere is emphasized with knotty pine log walls dotted with deer trophies and other critters, a warm fireplace and heavy pine chairs and tables.